I suffer crawling out of bed in the morning. It is what I imagine a bear would experience upon waking from hibernation; grumpy, disoriented, hungry, thirsty, with an excruciating need to pee. This morning, as usual, the click click of Molly’s nails on the floor and her whine of “get up!’ have brought me to a state of semi-consciousness. Geez this dog really needs to get a life. Shortly thereafter, still abed in my bear-like state, I hear husband Bob rattling at the door with his keys. He’s coming in from a long night at the hospital. I have to be nice. Now that’s a stretch for a bear. Nice? I scramble to the door. What if he catches me still abed? I should have been up an hour ago. Oh, wait. Don’t have to go to a ‘job’ this morning. It’s all cool. But I seriously need the bathroom. I need coffee. Hi Bob! Have a good night? Bob does the grumble, grumble thing. Can’t hear the man. He mumbles his grumbles. Glad you had a good night honey! I’m heading straight for the bathroom so the grumble mumbles sail over my head. Ahhhhhhhhh. Much better now. Coffee. This coffee maker is so slow. Is there some way to increase the drip? Guess I could clean it. All that build-up makes great coffee though. Slow? Or good? What’s it gonna be. My patience is legendary in its non-existence. And the bear begins to awake. My sofa has gone to the dogs. Luckily we have another one otherwise all human interaction in the living room would take place on the floor. I have vacuumed and scrubbed this poor piece of furniture so many times, its next incarnation will be smoke. It is destined for the burn pile. 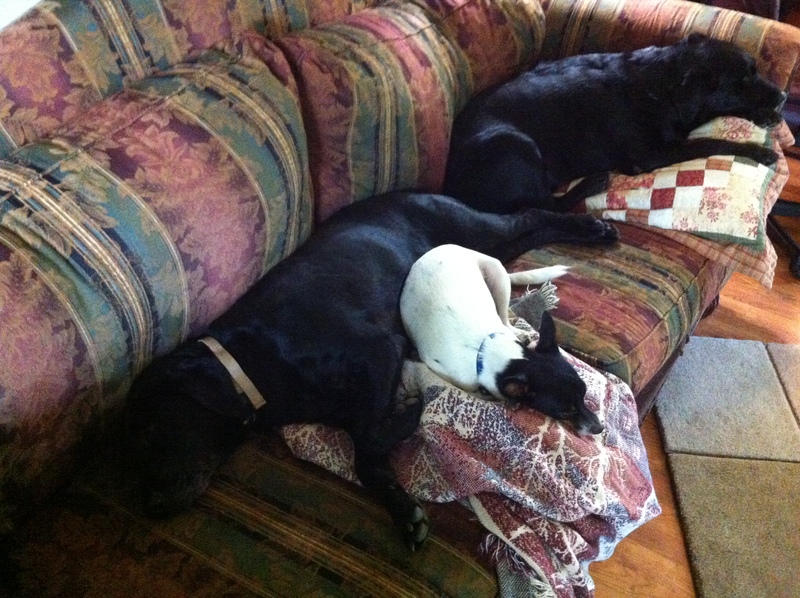 In the meantime, I suppose the dogs are happy critters. However Molly’s nap is rather irritating considering the click-click-whine thing. Let me repeat. The dog is neurotic. Anyone know a good dog therapist? Donations toward her mental health will be gratefully accepted.